"How to Perform Mold Inspections"
This thread is dedicated exclusively for those students currently enrolled in the InterNACHI course titled, "How to Perform Mold Inspections." methods to help prevent mold growth. The course has enhanced my vocabulary understanding and availability to do inspections. I now have a broader spectrum or scope of mold inspections cause and effect. I particularly like the survey that is to be taken into each house, and the information that would be provided when the questions to that surveyor answered. Taking this course has also refreshed in my mind a lot of things that I already knew in the past but have forgotten. That allows me now to be more thorough in my inspection and,be more complete in all that I do when it comes to mold. As part of the mold inspection certification i read the article on flood damaged properties. I found the article very interesting and really liked the main concerns when entering and dealing with a flood damaged property. The biggest i feel is the risk of electric shock as the electrical outlets and systems could be compromised if the water level reached them. All in all i thought it was an informative article. I read the garage inspection article and found it to be very informing. In garages I find that for some reason people make structural modification that weaken the load carry ability of the roof system. So I'm always looking for that. The above pictures are of a HVAC system installed in the attic. The condensate pipe actually drained into the catch pan and then the overflow pipe routed it to the outside. The water in the pan covered the discharge pipe which could allow unsanitary water and/or mold spores to back siphon into the unit. The first article I read was “Unvented Roof Assemblies”. In my opinion, the advantages far outweigh the disadvantages. More living space (or temp controlled storage), less fluctuation of the indoor temp, less moisture intrusion/less chance of mold. The only real cons I came up with would be the diminished service life of asphalt shingles due to excess heat and ice. Although here in SC, most roofs are metal, so not really an issue. The second article, “Moisture Intrusion” was basically a review of the general premise of this course. It mentioned the different sources of moisture intrusion, (condensation from sweating pipes, roof and plumbing leaks, etc) and some of the problems it may cause. It concentrated on mold, but, as learned in this course, structural damage and visual displeasure would also be included. Here is a pic of an crawlspace inspection. The entire basement dirt floor was extremely moist from previous heavy rains. The picture shows the form boards rotting and showing possible signs microbial growth. Read the article "Memo to Real Estate Professionals RE: Inspecting Crawlspaces with Water". I'll be keeping this memo for future use. The picture contains a plumbing pipe jack vent and neoprene flashing. The flashing fasteners and edges have been sealed. This can indicate that the area has leaked previously. Further inspection revealed no observable signs of water penetration or water damage in the attic or interior finishers of the dwelling. We recommend to annually inspect the area, as the sealant will likely require continual maintenance and reapplication. In the event that leakage does occur, we recommend having a trusted roofer replace the neoprene flashing. Note, sealant is never a sufficient substitute for proper installation of flashing. I have to say I didn't quite know what to expect when I signed up for the mold inspection course. I am licensed insurance adjuster and home inspector, and I have previous experience in dealing with mold and mold mitigation companies. The course is very informational, well organized, and easily kept my attention. I got a lot out of the detailed sections about types of mold and sampling equipment. Its also, great to have a resource I can refer back to as a refresher. I have learned a great deal and I am excited to begin to offer this service to my clients. Thank you! The attached photo shows apparent organic growth on the wood wall surfaces of an unventilated stairwell located in a basement. Areas along the basement walls had signs of active moisture intrusion including moisture meter readings that varied between 20% and 90% along the baseboards of finished walls. A waterproofing protective coating had been applied along the inside of basement walls. Contributing factors include inward sloped soils around the exterior of the home, defective plumbing vent and chimney flashing above the areas of moisture intrusion. An examination of an unfinished basement area showed apparent water intrusion in two areas: One near the HVAC unit and A/C water evap. drain, and the other near the water supply inlet pipe/meter. Moisture readings near these areas were slightly elevated and the appearance of possible mold was visible. A visual inspection of the water sump pump/crock area showed the water level to be far above that which would normally trigger the pump switch, and only slightly below the level at which water intrusion to the basement floor would occur. Being from Alberta, I wanted talk about something we see up here every spring when the snow finally leaves. We call it snow mold and it looks similar to cob webs on matted down grass. During the winter as the snow covers the ground, a mold grows and becomes exposed as the snow melts in the spring. People with allergies and hay fever suffer a lot until the first good rain of the spring causes the mold to soak back into the ground and settle the spores. Care must be taken not to transport these spores into the house via cross contamination from footwear before that first rain. Also a concern are pets that go in and out of the house routinely and then lay about on carpet or furniture. Again moisture control is important so that mold spores inadvertantly transported into the home cannot have a chance to grow. Small bathroom with a musty smell. There is a window in this bathroom but it will not open. 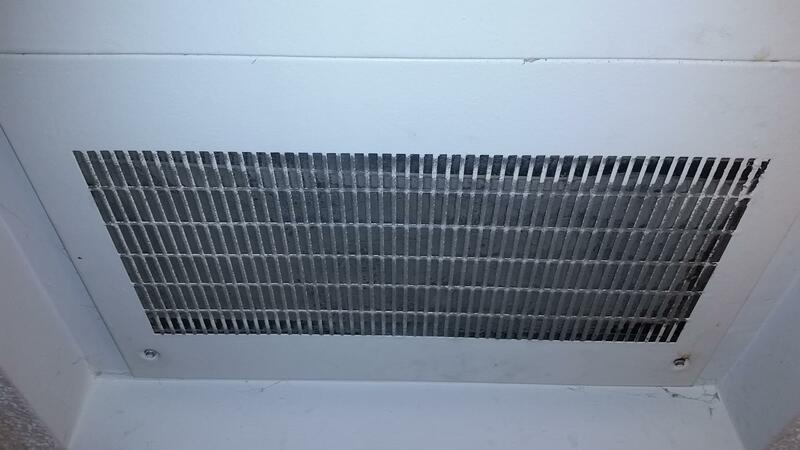 No vent fan is installed. View under the vanity - No leaks were noted and the area was dry. Small stain noted on floor under toilet shutoff. No other leaks or moister were noted. There was also a small area of the wood paneling that looked dusty. No other signs of water intrusion or damage was viewed. These are photos of an unfinished basement I inspected in a vacant home built in 1974. There were multiple cracks in the foundation walls and the most efflorescence I’ve ever seen. This accompanied a musty smell in the basement. In addition, there was no combustion air supply for the furnace and water heater. All of which contributed to the musty smell and possible presence of mold. The picture above is from a basement living space that appears to have apparent mold growth on the building materials behind the finished surface. The basement had water intrusion from a heavy rain and improper roof drainage system. Further testing is required to establish if the unknown substance is in fact mold growth. I chose to read the "Mold" and "Moisture Intrusion" articles. As with everything on this course they were very clear and informative. I found the ten things in the first article to be the most useful as I can point towards it for customer's general questions. I just want to make sure I understand the SOP for carpet sampling. The section below describes taking a sample in a living space like a den, then says to take a sample near a bed, apparently using the same filter for both rooms. Shouldn't a new filter be used for each separate room? By mixing two samples how would you determine a possible mold source from one room to the other? • Choose a 6-foot by 3-foot sampling area in front of a sofa or large chair where occupants spend a lot of time. Vacuum this area thoroughly. Next, select a 6-foot by 3-foot area in a bedroom alongside a bed. Remove the filter and place it into the bag that came with the unit. Mail it to the laboratory. During a recent home inspection, I noticed a musty smell. I found that the hallway carpet was wet. When the air conditioner was turned on, water was dripping from the return air vent saturating the carpet. As it turns out, the condensate drain line was clogged causing the water to leak through the vent. The condensate line was cleared and the carpet was replaced. This mitigated the mold problem. The first picture below shows the floor of a downstairs bathroom that was damp at the time of inspection and had water stained grout. Further checking revealed that the supply hose connection for the toilet had a small slow leak at the shut off valve. The second picture shows the backside of the common wall with what appears to be microbial growth. This wall was also within 3 feet of the house water heater and the boiler. I recommended that the owner have remediation done on that area of the wall and that the supply hose/valve for the toilet be repaired/replaced. For my required reading I chose “Air Sampling for Mold Inspections” and “Tape Sampling for Mold Inspections”. I found this course to be very interesting and informative. I am much more confident that I can correctly perform an accurate and professional mold inspection.